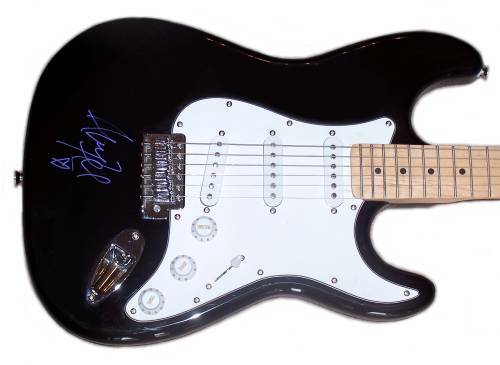 A black electric guitar signed by Amy Lee of Evanescence. Comes with a Certificate of Authenticity. Amy Lee is an American singer-songwriter and classically trained pianist. She is co-founder and lead vocalist of the rock band Evanescence. She cites influences ranging from classical musicians such as Mozart to modern artists Bj?rk, Tori Amos, Danny Elfman and Plumb. Along with her contributions to Evanescence, Lee has also participated on numerous other musical projects including Walt Disney Records' 2008 release of The Nightmare Before Christmas soundtrack. Lee has performed collaborations with artists such as Korn, Seether, and David Hodges. Lee is also the American chairperson for the international epilepsy awareness foundation, Out of the Shadows. Revolver Magazine named Lee the #1 Hottest Chick in Hard Rock for their 2011 annual issue and she appeared on the front cover. In February 2012, VH1 placed Amy Lee at #49 in the Top 100 Greatest Women in Music. ~ Wikipedia.